It's been an exciting few days for us. 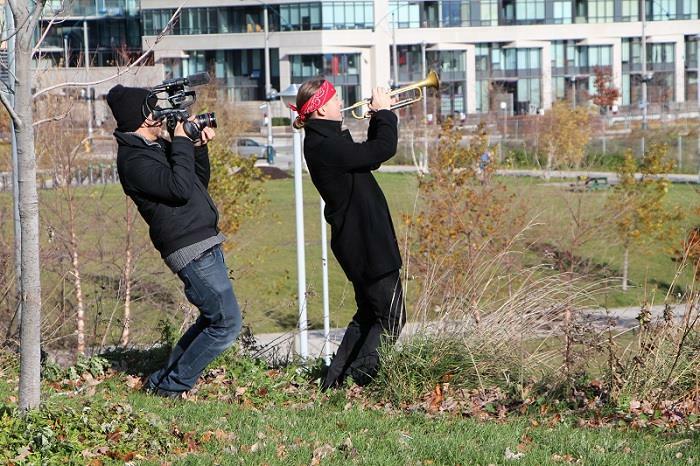 On Friday, November 22, we set out to record our first ever professional music video. Rich Williamson, Shasha, Alex and Jason were our film crew who had put together a great storyline and an ambitious but well planned itinerary for the day. We started out just with Mike, Rich and Shasha meeting at Union station to get a few shots of Mike exiting the station in rush hour - surrounded by business people in suits. Excitement was not limited to the filming itself - believe it or not - there was a pursuit by security guards involved! As per their warkie-talkie's: "Stop the guy in the red bandana!" Brilliant start to the day at 7am! 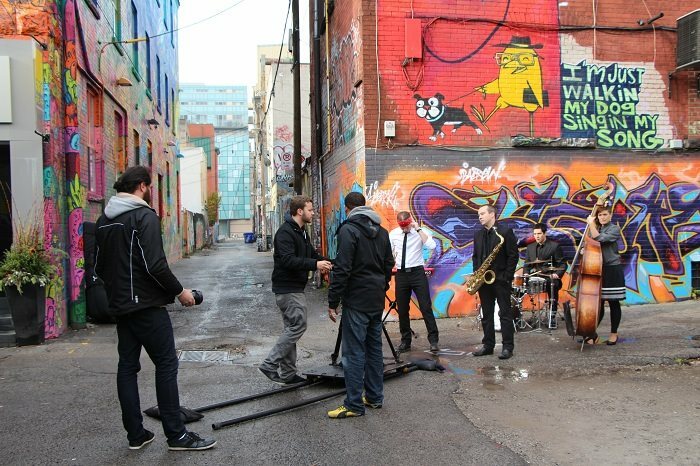 After getting a few shots in the financial district, we went on to meet the band at Graffiti Alley to get some colourful segments filmed with Carlie, Teri, Dave and Paul. The weather was not our best friend throughout the day - the cold was to be expected but the few rain drops made things all a bit more interesting. We got the band shots in the bag very swiftly though, said our goodbyes to the girls and Dave and headed to our next location where we filmed Paul's solo and the "you, then me, then you, then me" segment between Mike and Paul. The rain forced us to be a bit creative with which equipment can be used as an umbrella! 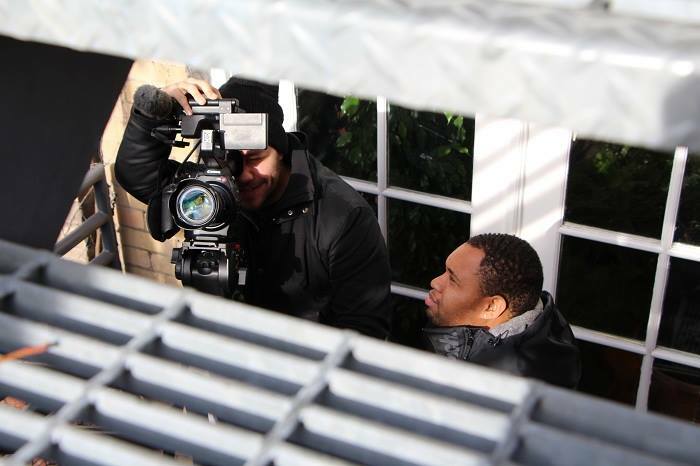 After a quick stop for lunch on Queen street, we went on to meet Kevin to film his solo on the rooftop of the 401 Richmond building. Unfortunately, by that time the rain had gotten much worse, we had to adapt to the situation and set a new date with Kevin for the next day. The rest of the crew headed up to another beautiful roof top - right around the corner from The Rex Hotel. A lawyer who frequently hangs out at The Rex had kindly offered the rooftop of his office to use as yet another - and by far the most amazing - film location of all! Here, Mike got to play high above the city - with a view of the CN Tower and an ocean of condo buildings. We were also really lucky to catch an amazing sunset from here! Day 2: All looked very promising as we left the house (after Rich got to film Mike having Breakfast and choosing his clothes for the day!) We arrived back at the 401 Richmond building just on time. As we shook hands with Kevin, we did not believe our eyes: SNOWSTORM!! An added bonus - the key to the rooftop would no longer work and a rather grumpy office manager told us over the phone that from today the rooftop is closed for the winter! In all fairness... I would be grumpy too if I got woken up at 9am on a Saturday... and yes, there was a snowstorm... Not that our determined crew was going to back down because of a few bumps in the road though! We ended up finding a great little staircase in the courtyard and Rich and Jason managed to work their magic to get the shots we needed! Overall we had a tonne of fun and it was a great experience! Thanks to the film crew, the band and everyone else who was involved!